RF MODULATOR YB7-002 CH 4. 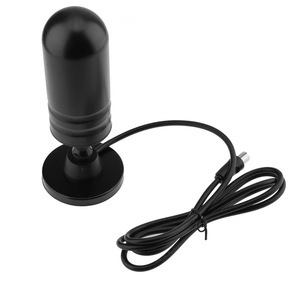 Changzhou Yabang Antenna Co., Ltd.
6. Adjustable A/V ratio,RF output level,video and audio modulation index ,Controlled by Advance Micro-processor. 7. Adopt high quality SMPS,ensure wide power supply range. 8. IF loop-through, Front panel -20dB test point capability. Built-in active combiner eliminates unnecessary cabling and potential The modulator is a space saving,fixed channel modulator sysetm. Each modulator is SAW filtered and is factory set to the desired channel and proper offset. Main Fetures Two cooling fans for long life performance Easy setup,Internal fans for cooling modulators .
) Agile :105dB&mu;V(Adj. ) A/V Ratio -11 to -18dB(Adj. Frequency Stability Fixed: &plusmn;5KHz Agile : &plusmn;5KHz Video 75&Omega;F-female Input Level 0.6-1.5 Modulation) Video C/N 50dB Hum/Noise -50dB Modulation Range 0~90% Audio 75&Omega;F-female Input Level 1Vp-p(25KHz Dev. It is also equipped with 2 ASI ports and IP port to output TS. It also can be used for monitoring, training and educating in company, schools, campuses, hospital. Please fell free to call us at any time if there is any questions. Shenzhen Dingshengwei Electronics Co., Ltd. PRODUCT OVERVIEW: The CSP-2401s is a 3RU rack mounted chassis that allows for installation of up to 24 pieces microprocessor-controlled fixed mini-modulators. Built-in active combiner eliminates unnecessary cabling and potential connection problem and ensures high output level . ) Frequency Stability : &plusmn;5KHz Video :75&Omega; F-female Input Level : 0.6-1.5 Modulation) Video C/: 50dB Hum/Noise : -50dB Modulation Range : 0~90% Audio : 75&Omega;F-female InputLevel : 1Vp-p(25KHzDev. The device can be wildly used in public places such as metro, market hall, theatre, hotel, resort, etc for advertising. It means the single DVB-T carrier simply can't carry the 2 channels 1080i HD program if the average bit-rate exceeds 15Mbps. Its high integration allows users to transmit more programs with fewer devices. Encoder Modulator,full Encoder modulator, mpeg4 encoder modulator dvb-t Outline COL5011U series Enco-modulator is individual module design, and clients can choose different module to be combined accordingly. The signals source could be from satellite receivers, closed-circuit television cameras, Blue-ray players, and antenna etc, and the output signal is to be received by matched STB. It also can be used for monitoring, training and educating in company, schools, campuses, hospital&hellip; besides, it&rsquo;s a good choice for bars to offer SD sports channels, for VIP entertainment channels, and more. E.g. 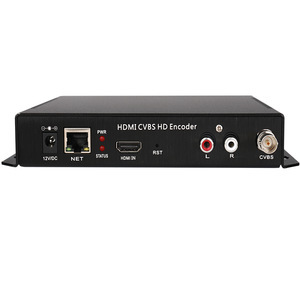 HDMI/YPbPr/S-Video/AV input for encoding MPEG4 AVC/H264 HD/SD video encoding, MPEG1 Layer II, MPEG2-AAC, MPEG4-AAC audio encoding optional R ecord encoded TS and playback TS files (*. The USB port is designed to record encoded video (TS) and save it in ts files in the USB Keys or Hard Disks, and then the ts files can be playback through the USB port. Key Features n HDMI/YPbPr/S-Video/AV input for encoding n MPEG4 AVC/H264 HD/SD video encoding, n MPEG1 Layer II, MPEG2-AAC, MPEG4-AAC audio encoding optional n R ecord encoded TS and playback TS files (*. Alibaba.com offers 9,646 rf modulator products. About 78% of these are radio & tv broadcasting equipment, 3% are other home audio & video equipment, and 1% are other radio & tv accessories. A wide variety of rf modulator options are available to you, such as free samples, paid samples. There are 9,700 rf modulator suppliers, mainly located in Asia. The top supplying countries are China (Mainland), Australia, and Turkey, which supply 98%, 1%, and 1% of rf modulator respectively. Rf modulator products are most popular in North America, South America, and Domestic Market. You can ensure product safety by selecting from certified suppliers, including 2,315 with ISO9001, 1,403 with Other, and 304 with ISO14001 certification.